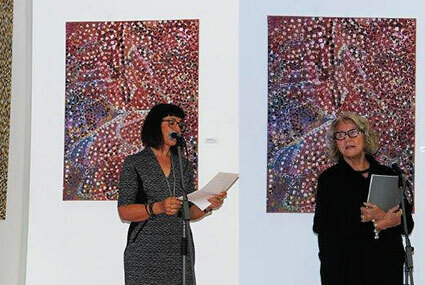 An exhibition of Utopian art which was opened by Janet Holmes a Court has been a great success for South Fremantle gallery, Artitja Fine Art. Gallery Director, Anna Kanaris, says Standing on Ceremony: The Utopia Journey attracted a full house, as did the curatorial talk given by Sharon Tassicker, Collections & Exhibitions Manager of the Janet Holmes à Court Collection who spoke about the history of Utopia and the Holmes a Court Collection. Utopia, which lies 270km NE of Alice Springs, was named in the late 1920s (as the story goes) after the two brothers granted the pastoral lease to the 1800sq km tract of land almost perished after losing their direction but were saved when they stumbled across a water source and a rabbit, leading them to believe they had found their Utopia. For decades, many of the Aboriginal population worked as jackaroos and jillaroos at Utopia station in what was largely a cooperative relationship with the station's owners until 1979, when the legal title of the land was handed back to the traditional Indigenous owners. It was during this time that they turned their hand to more creative pursuits, learning batik printing and by 1988, eighty-eight artists embarked upon a project which would see each of them produce a silk batik length. The result culminated in an exhibition called Utopia - A Picture Story, the entire collection of which was acquired by the Robert Holmes à Court Collection the following year. “The purpose of our exhibition is to highlight the history and importance of the Utopia artists, who have been documented over the past several decades and beyond as a highly sophisticated group of fine artists,” says Anna. 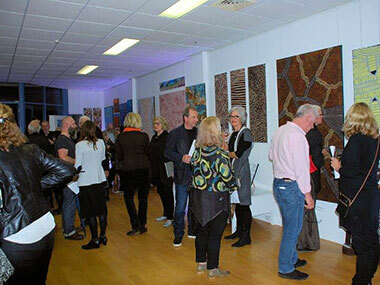 “After the batik success, they changed their preferred medium to painting and wood carving and continue to do so”. A widely painted theme is Awelye – Women’s Ceremony, a body paint design highlighting the importance of ceremony in keeping culture and country alive. “It’s not only women who paint, the men do also, however the women have been more experimental and willing to push the boundaries in their story telling designs." 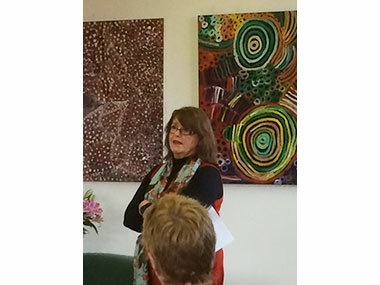 The Utopia artists differ from many of the art producing areas in remote Australia in that they are an independent group. “This model works for them," she says, "it probably wouldn’t for many others and I think this has to do with the history of both their personal involvement and evolvement”. Standing on Ceremony: The Utopia Journey includes works by the renowned Utopian artist sisters Ada, Gloria and Nancy Petyarre, through to a younger generation of artists including Charmaine Pwerle and Selina Teece. The show runs until Sunday 22nd May at Earlywork, 330 South Terrace, South Fremantle then continues online or by appointment.